A dynamic analysis of global temperature data gives a value of ECS = 2.5C ± 0.5C . Values above 3.0C or below 2.0C are ruled out. 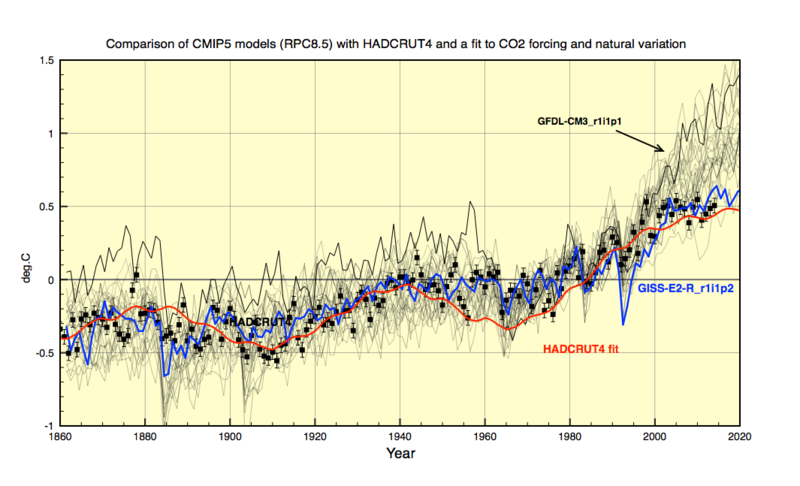 This analysis is based on two assumptions: 1) That net climate forcing follows that used in CMIP5 (ref 1). 2) That climate equilibrium is reached with an e-folding time of 15 years (derived from GISS Model-II). 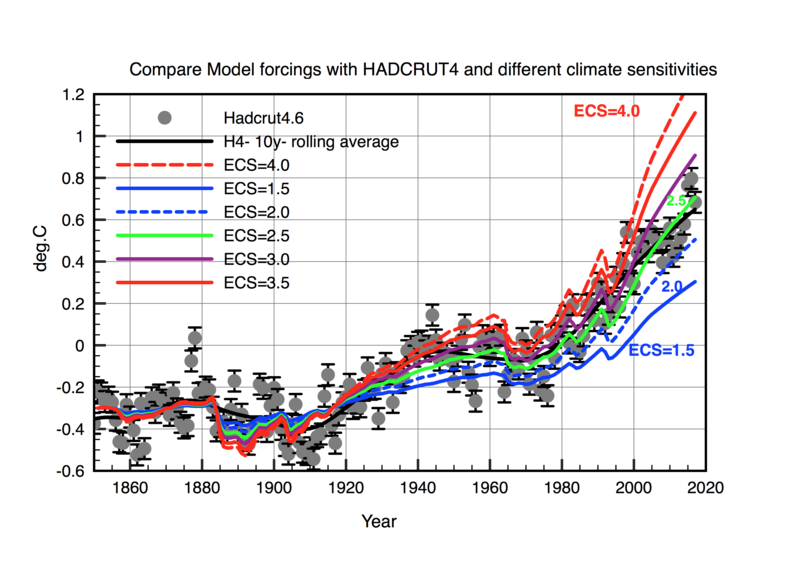 Detailed comparison of Hadcrut4.6 with calculated temperatures for different ECS values. Equilibrium Climate Change or ECS is defined as the increase in global temperatures following a doubling of CO2, once the climate system has stabilised. Models can calculate ECS by running a step function for CO2 concentrations from say 280ppm to 560ppm and then plotting how the temperature responds with time. Each model gives a different value for ECS, and the spread in values represents in AR5 as an estimate of the uncertainty. I am going to use one of the simplest models, GISS Model II to investigate this lag effect of climate stabilisation which is mainly caused by the heat inertia response of the oceans to increased forcing. Fig 1: Response temperature curve for GISS Model 2 following a sudden doubling of CO2 in 1958. and fit described in the text. The e-folding time is 15 years. where is the initial CO2 concentration and C is the incremental value. A doubling of CO2 alone give a forcing of ~3.7 W/m2 which at equilibrium is balanced by a surface temperature rise of 1.1C by applying Stefan Boltzmann’s law. Ignoring feedbacks and using results in ECS being ~ 1.1C. Higher values of ECS are due to net positive climate feedbacks, mainly from increased H2O. CMIP5 models give a large spread in predicted ECS values due to the different ways H2O and cloud feedbacks are handled. Can we measure ECS directly from the data ? 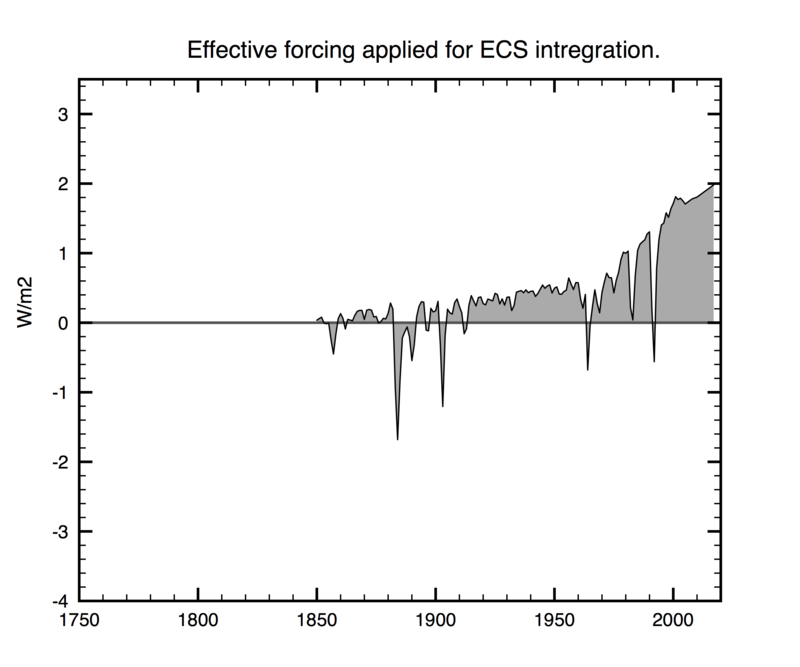 The problem with measuring ECS from the temperature data is that net forcing is increasing every year so we can never wait long enough for the climate to reach an equilibrium state. Given these constraints I adopt a different approach. We treat the temperature record at any time as the response to the sum of previous discrete annual pulses of forcing. Each pulse causes a time dependent temperature response as shown in Figure 1. The resultant annual temperature for year n is then the integral of all previous responses up to that year. This procedure can then be repeated for various possible values of ECS and compared directly to the temperature data. 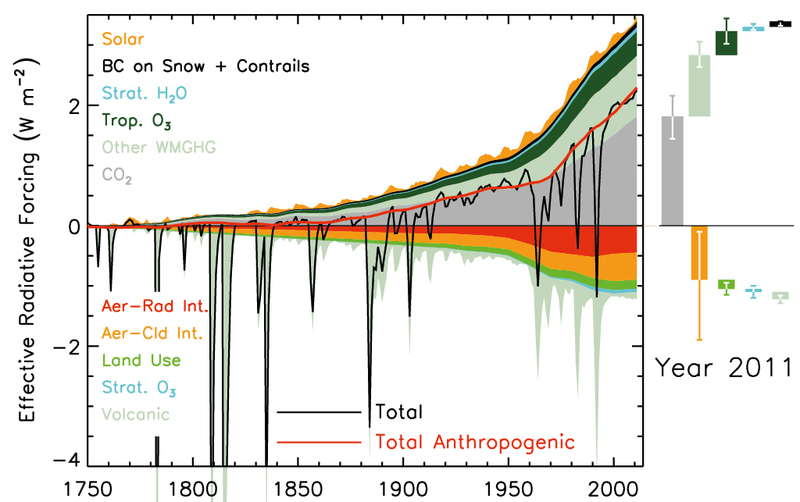 Rather than using the CO2 forcing directly we use the ‘Total Anthropogenic’ AR5 forcing data as shown below, which turn out to be almost the same thing. The actual forcing data used in this analysis which is almost identical to CMIP5 net Anthropogenic. where 3.7 is the direct forcing due to a doubling of CO2 (calculated from ) and f is the feedback parameter. This then allows to calculate the feedback parameter f corresponding to a particular value of ECS, and then use f to to calculate the impulse forcing response. The resultant values of f are as follows. A perl script was written to integrate forward past temperature responses into a predicted annual temperature for various values of ECS by applying equation 1. The results are compared to the annual Hadcrut4.6 values. 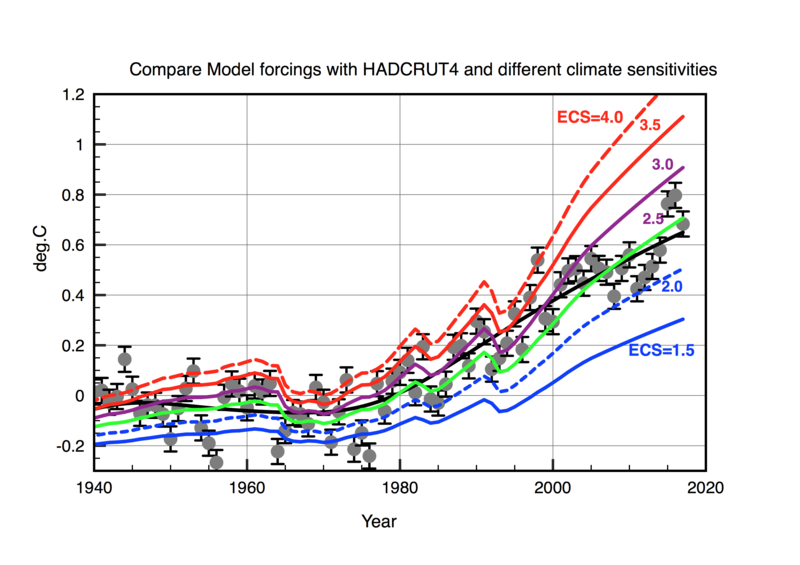 Comparison of Hadcrut4.6 annual temperature anomalies with predicted temperatures for different values of ECS. It is instructive to look in more detail at the recent data as it then becomes obvious that high values and very low values of ECS are ruled out. The error is based on post 2000 temperature values. ECS=2.0 falls within just 12% of data point errors (0.05C) while ECS = 3.0 falls within 24%. This is to be compared with ECS=2.5C which falls within 84%. Both ECS=2.0 and ECS=3.0 are about 2 sigma from the mean average shown in black. By 2017 ECS=2.0 lies 0.15C below the mean and ECS=3.0 lies 0.26C above the mean. Therefore I estimate a 95% probability that ECS lies within this range. If climate sensitivity is 2.5C then global temperatures can never rise more that 2.5C above pre-industrial levels so long as CO2 levels are kept below 560 ppm. This is a far more achievable goal than many activists are calling for since it requires only gradual reductions in CO2 emissions by 2100. This then gives us time to develop realistic alternatives, which I am convinced must have a strong nuclear base. This entry was posted in AGW, Climate Change and tagged Climate Sensitivity, ECS. Bookmark the permalink. Clive Best just joined the alarmist camp. Didn’t Spencer & Christie get an ecs of 1.1 ? I am being generous and assuming that all warming is due to human activity, that models apply the correct forcing and that the globally temperature data is correct. Even then climate sensitivity is not that alarming. 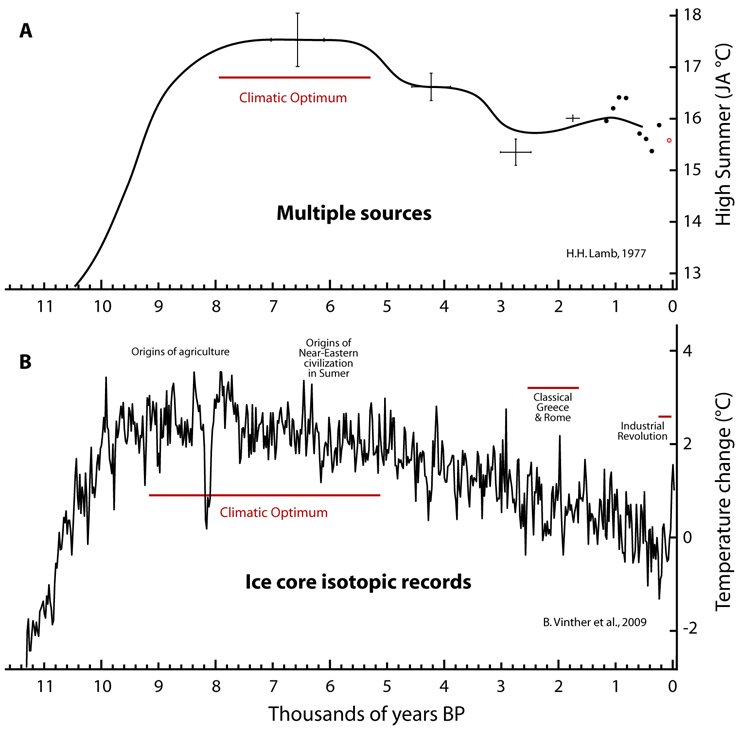 Temperatures change by 4C between an ice age and an interglacial. At worst CO2 emissions will be about half that. That is true. If there are natural cycles lasting many decades then that changes the results. However my point is that even the worst case scenario is not really that alarming. J Martin, the first mistake is to assume that there is such a thing as ECS in the first place. I could understand someone thinking it might apply to H2O, but not CO2. There has been a lot of experimentation with this over the years. ATTP gives a summary here. You are using a one box model – just an exponential decay, one time constant. Tho box models consider two time constants. ATTP got an ECS 2.6, Tamino gets 2.5. So a lot of consistency there. I think the way to think about it is this. T is a linear functional of past F, so it is a convolution with some (unknown) impulse response w. You can get some handle on w by trying various F’s. The standard ECS uses a step F and gets T at infinity. That gives the integral of w, or zeroth moment, which is the ECS. TCS is an experiment with a linear ramp F, etc. You are adding the assumption that w is exponential decay with time constant 15 years. That means that the zeroth moment fixes w. You could deduce TCR etc. Yes that’s right. The problem is that all we have to pin down climate sensitivity is the long term temperature record which is one dimensional, so far as ‘global’ warming goes. I don’t think adding a 2-Box Ocean & Land makes a lot of difference, unless you compare ocean and land separately. Since we all get an ECS value of 2.5C (mine includes data up to 2017), why is there still so much IPCC uncertainty ? Is it not perhaps to keep the modellers happy ? Those models with high sensitivity are clearly wrong(IMHO) and their continued impact is being exploited by green activists. The usual argument they use is the precautionary principal. i.e. we should plan for the worst case scenario in case it turns out to be true. The problem with that argument is that we only get one shot at this, and if we back the wrong technology by acting too soon, modern society will collapse. I think ECS is the crucial value to get right, and so too is really understanding how the Carbon Cycle works. If emissions stop, how will CO2 levels really decay back to natural levels. I don’t think the carbon cycle is really understood. The Bern model is just a parameterisation. Because there are much longer time scales that your simple exponential model does not take account of. You are using GISS Model II, which is a 1983 effort. It was not coupled air/ocean. It was air only, which only a very simple modelling of the SST interface. It did not capture the long time scales of diffusion into the ocean. ECS is the integral of the impulse response function. Long timescale processes (tails) don’t interfere much with a fit on a 15 year scale, but can add hugely to that integral. So are you not really saying that the uncertainty lies in ESMs and our understanding of the carbon cycle ? The uncertainty comes also from forcing so as from observation. If you play out them, you get nearly the same range as in IPCC-Reports e.g which is done(partly) in Haunstein et al 2017 as a result of, human induced warming could less/more then observed warming. Your approach is assume, that warming is all induced by forcing and forcing also observation is correct, but you dont know for sure, its also possible, that natural variability has warmed/cooled, early observation is incorrect or forcing is over/undereastimate. Another point is, you strictly assume that forcing and warming is linear, if in real climate system are none linearities, your calculation becomes wrong. Isnt really true, you showing the more likely scenario, worst case would mean, overestimated forcing, underestimated warming in observation and and cooling in observation due natural factors, them you get fast ECS arround 5K or higher. No one seems to understand diffusion. The tails are not damped exponential, but 1/t or 1/sqrt(t) depending on how much dispersion there is. Presumably you mean heat diffusion in the oceans. Even if the diffusion time s longer I would assume the normalised temperature profile remains the same before and after a doubling of CO2. Furthermore this is something that should be reflected in seasonal temperature change profiles which is of the order of 10C for SST. If you apply these same calculations to CMIP5 models, what do you get? How does it compare to the known model ECS values? Here is a comparison of CMIP5 models to data. You see again that models with high sensitivity cannot reproduce the measured temperature record. The best fit is GIS-E2-R which has ECS ~ 2.3C This was from mid 2015. I think Mark means something different. Assume you take the temperature time series of a CMIP5 model, treat is as the observed temperature and infer ECS. Then compare it to the actual ECS of that particular model. How well do the two numbers agree? The result will probably that you strongly underestimate the uncertainty in your results above. I am pretty sure that the numbers would agree almost exactly. In other words the theoretical curve for that ECS would pass straight through the model points. However that does assume that the relaxation time for each model follows approximately the same exponential curve. The interesting question is: Do models behave differently to each other following a step doubling of CO2 . If model A needs 1000 years to reach equilibrium whereas model B needs just 50 years then there is a serious problem – not only with my simple analysis but with CMIP5 in general. From 21 abrupt4xCO2 simulations median e-folding time is 13.4 years and 5–95 % range is 7.1–23.1 years. Inferred ECS is 1.9 (1.1–2.4) C versus truth of 3.2 (2.1–4.2) C.
For 1861-1880 to 2007-2016 I now get HadCRUT4 lying near the 50th percentile of the models. Same for Berkeley Earth vs global model air/water temperatures. In my first comment, I mean did you try calculating the ECS of individual models using their historical runs with your technique? Does your calculated ECS match the known value for a given model? If your results matched then it would be interesting to see why. It would be exciting if a technique that uses the temperature series favours a global-air ECS around 2.5 C, given that modelled temperature change basically matches the observations over 1861-2017! Did you spatially mask the model results to be the same as the HadCRUT coverage before comparing them? (HadCRUT doesn’t cover the whole globe; the models do). Same question re: ocean temperatures and air-just-above-the-ocean temperatures. Last, did you use the real-world forcings in your model, before comparing its results to the real-world temperatures? Make sure you’re comparing apples-to-apples. However here I am doing something much simpler. 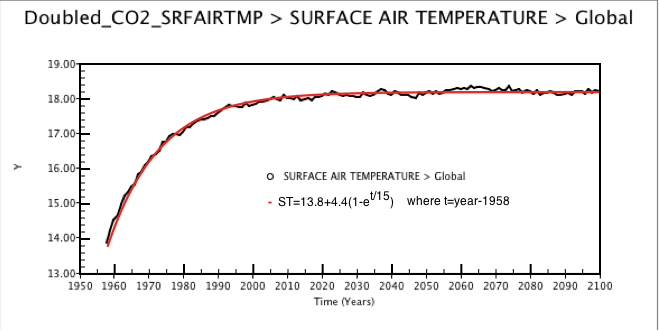 I take the global scalar temperature and compare it to an integral of simplified global forcing model based on the AR5 model forcings. As such there is no need to mask land/ocean etc. (reading it again) Okay, I’ve got it now. However.. To do the comparison between the real world temps and the model results, you are using HadCRUT, right? You are comparing the model scalar global temperature responses for a given ECS (which are global) to HadCRUT (which is not). Correct? Clive, it’s always good to see new approaches to reckon ECS. I am thinking that one could look for effects of AGW independent of GMST to help constrain ECS. The GHE not only raises GMST it also dampens diurnal and seasonal variation. The Moon’s surface gives us data for what the surface temp response would be without an atmosphere. The GHE essentially is adding atmosphere and thus we can simply extrapolate what that would do. 2) The peaks and valleys in diurnal temp should also delay and dampen. A shrinking of diurnal temperature range over the last century is documented for land in Vose (2003), Thorne (2016). 3) Lastly, we should see land warming faster than SST. Although this technically is being observed it is only due to proportionally more land in the upper northern hemisphere. A great apples to apples test is to look at island stations compared to non-marine climate land stations. I did this quickly at Nick’s site last month and discussed the result with Nick at his blog here. Still waiting if he has a resolution. Maybe you could take a look at this Clive. Surprisingly the islands show the same response as inner continental stations. I should disclaim that non-GMST responses are directly related to ECS since they do not likely correlate with feedbacks. However, it would be nice to have independent indications of AGW forcing to constrain it from natural variability and non-climate effects, (recording biases like UHI). Yes nights should warm slightly as IR loss from the surface gets slightly dampened. This is very difficult to separate from UHI in urban areas. Likewise winters should loose slightly less heat to space. The land ocean temperature comparison is a bit strange as land seems to warm more only in the late 20th century onwards. In reality the ocean data is sparse in the time of bucket measurements on ships. This was acknowledged by Tim Osborne. We are closer to NOAA’s record after WW2, showing a bit cooler temperaturatures from 1940 through 1979. We also show warmer temperature in the early 1900s, eliminating the cold excursion around 1910 found in both NOAA and Hadley. The ship bucket and engine intake temperature measurements have been adjusted many times, each with a pretext but also without a scientific basis, like in situ testing. I suspect that the problem of island and coastal anomalies not matching the adjacent seas was known but ignored. I’m hoping that it will not be used now simply as another degree of freedom to adjust past wrongs with the pretext of new insight. Call me cynical, but it seems like the adjustments always to bias recent warming up and fix old adjustments back to where they needed to be, or to smooth out variability. The beauty of Karl15 was that they had an opportunity to bias the past temps (or un-bias them) and never need to deal with the ship adjustments coming back to haunt them again since they were forever being replaced by buoys and Argo. They could take a sweet parting shot. If Zeke is looking at the island and coastal stations he must see that their warming is much faster than the seas around them but no faster than non-coastal. My suspicion would be this is evidence of non-climate effects in land stations. Zeke’s conclusion is likely that the SST warming is not properly being captured. But in all cases if the island and coastal trends are matching the non-coastal we have a puzzle because there is assumed to be a steadily growing and quite sizable radiative imbalance. And, marine stations and non marine stations should be recording divergent trends. Clive, you agreed that night and winter cooling should be dampened from EGHE. You were silent on my proposal that seasons and diurnal radiative responses per se should be flattened temporally as well. By the way, I meant Vose 2005, not 2003 studied global diurnal temperature range. Both Vose (2205) and Thorne (2016) agreed that the DTR narrowed significantly between 1950-1980 but pretty much flat lined from 1980 to present. This does not follow an expected fingerprint of EGHE from AGW. I suppose if it did there would be big news and there would be more than two papers in 50 years on the topic. Yes DTR should decrease because minimum temperatures rise faster than maximum temperatures. Islands will show much the same trend, because land based diurnal temperatures are much greater than sea surface temperature ranges. For this reason I don’t think Zeke can really use them to correct the SST data. Of course their real problem is to match energy balance of oceans and land. Oceans have to be cooler to match that increase in Ocean Heat Content ! Clive, there are dozens of 50-year-plus land stations that are less than 300 yards from the ocean. How much is their expected profile supposed to match land rather than sea temp behavior? There must be a spectrum from buoy to tiny island to large island to coastal mainland to non-coastal mainland. My point is that if a coastal station correlates 60% with the sea in its daily and seasonal temperature profile but has zero correlation in its anomaly trend then either the sea measurement is biased or the land is. Zeke is likely ready to assume the sea is biased due to less rigid measurements. Why? Because systematic non-climate effects occurring at land stations coastal stations is an unthinkable scenario for Zeke. In fact island and coastal stations should be ideal for quantitative analysis of non-climate effects since they have the perfect control comparison: a temperature buoy in the vicinity which can be assumed to have zero non-climate effects. Typically non-climate effects like UHI and micro-site raise the daily Tmin. Thus if the warmer station trends are due primarily to increasing Tmin that would be very strong evidence the stations were biased. And if non-climate effect bias was found in coastal stations which are classified as rural, (assumed pristine,) that would have radical implications for the entire land record. Have you read the coastal stations paper? Have you got any analysis that supports your claims? I can’t make any sense of your comments. I hope to get round to looking at the coastal stations in the next week or so. I agree that they should follow the same rend as surrounding ocean even if their absolute temperatures are higher. Mark R, I had not been aware of Cowtan, Rhode and Hausfather (2018) [full version] until you pointed it out. My thoughts on using island and coastal stations pre-dates the publishing this paper. As I mentioned I brought the topic to Nick Stokes here a month ago after bringing the topic up here at Clive’s months before that. Now that I have read Zeke’s paper I see it’s exactly as I had imagined. They found exactly what they were looking for: underestimated warming in SST and smoothing of the record to look more like the models (getting rid of unexplained variability). And, they overlooked what they could have found: an independent tool to clean out non-climate effects in the land stations. As the paper points out in its conclusion, there is no inherent way to know that the the coastal stations are more reliable than the SST. of problems in the existing records, although divergence between the existing records means that both cannot be correct. However, it would be safe to assume that the SST and marine air temp (MAT) are free from micro-site and UHI. So it would make sense to use them as a tool to get a ground truth on the coastal land stations. This could be done using the same type of analysis used in the paper, having SST and MAT as the origin on all marine climate effects in comparison to inland. Then if the temperature anomaly forms a step from SST to coastal station and all the other effects are a continuum relative to proximity then the step represents non-climate effects in the stations. There would likely be no conflict in the ERRST and COBE and HADSST if the focus had been finding the truth rather than finding innovative ways to adjust, warming as much as could be done with a straight face. Hi Clive, How does your analysis differ from that in Lewis and Curry? where F is the forcing at doubling CO2 and Q Ocean heat uptake. I am trying to fit the current global temperature curve with an integral over annual increments in forcing assuming a 15-y exponential equilibration. In effect the sum of the non-equilibrated parts in the annual exponential curves is energy imbalance or ocean heat uptake. I don’t see any mention of the many studies using paleo data showing stronger ECS at hotter climate states. von der Heydt did a good summary. The best study is that of Friedrich et al. published at the end of 2016, finding ECS at 1.8C in the deep glacial conditions, but +4.9C during interglacials…. and that was in milder CO2 than we’re forcing with today. The strong change in current albedo makes these high ECS estimates plausible. Too many paleo studies are finding ECS at the high end of the uncertainty range. The problem with paleo data is that we know that the main driver is changes in the earth’s orbit which modulates solar forcing at the poles tipping the earth into and out of glaciations. CO2 is really just a feedback to the orbital forcing. If you simply assume that CO2 forcing alone is responsible for observed temperature change then you will get spurious results. Let the slow Milankovitch cycles do what they do, and drive temperatures in the slow ways we see in the record. ECS due to CO2 and feedbacks on albedo etc should then be seen as a deviation from that slow trend and even an extrapolation of that slow trend. So in other words one could argue the opposite direction – that we should be comparing not to 1880-1910, but to what would be temperatures today if we just extrapolate the trend before human interventions. That curve was a slow descent. I don’t have a figure, but again I think it’s or order 0.1C or maybe even 0.2C depending on when you want to take your rising CO2 levels. indy222, If you are referring to M-cycle cooling then as you can see in the 10K-yr reconstructions that is on the order of 2C, which is 0.02C/century. OTOH, if you believe the Little Ice Age was the precipice of the Holocene finale then we can see cooling can be as abrupt as 0.3C/century. But, in that case we also need to be erecting statues of gratitude to Rockefeller and all the industrialists for saving the planet with fossil fuel CO2. When one sees a headline “1800 Years of Global Ocean Cooling Reversed by Global Warming” one should keep a few other facts in mind. 1) Time intervals for comparison are near infinite. 2) Cherry picking is standard procedure in climate science. 3) A century of warming or cooling can happen in one year with El Nino or volcano. 4) 15K years of cooling can happen in a year in case of a minor asteroid strike (or exchange of nuclear weapons). 5) Centennial-Millennial variability is poorly understood and is of yet un-modeled. Another point is trying to determine equilibrium sensitivity fitting purely to today’s temperatures over a very brief period which has forcing an order of magnitude or more stronger than any in the past. Using the recent Mann supported “pre-industrial” temperature baseline 0.2C cooler than the conventional 1880-1910 average (which is taken mostly because we don’t have great data before 1880), then gives for the GISS temperature set an anomaly of +1.45C (1.25C + 0.2C) at the close of 2016, and a bit cooler in ’17. That’s a transient CS of 1.45C when we’re not even halfway to a 2xCO2, with every expectation that transient will be low in such a rapid forcing as we’re doing today. ECS of ~4C or more makes much more sense, and is in agreement with many paleo studies from the past decade or so.. I don’t accept Mann’s argument. Pre-industrial could also be defined as the Holocene optimum. The problem with using ~ 1750 as the baseline is that this also coincides with the Little Ice Age which was for the Northern Hemisphere exceptionally cold. Transient climate sensitivity is defined by a 70-year interval and assumes a radiative imbalance caused by ocean heat content lag. Equilibrium climate sensitivity is the temperature change required to erase any imbalance caused by CO2 doubling. Also, the amplitude of livability is very significant so its not statistically sound to start or end on a peak to trough in the time series. The jagged abruptness of temperature variability makes it difficult to have confidence that the trend from a 1880-1900 baseline to present would have been dead flat if not for CO2. Here is a figure from an ice core reconstruction paper from last year, Lecavalier et al (2017). Full. Let’s proceed with separation of variables. We don’t know the content of the temperature measurements which surely contain the hundred year effects of increasing solar CME’s, their delay through the ocean cycles and all other unknown unknowns. Stick to the subject which you have outlined so well in your analysis of the HITRAN max forcing of CO2 of 4.7 watts. Whatever the H… else is going on in the earth temperature system it is not CO2 greenhouse driving any temperature rise above 0.012 C per year. As an old feedback control engineer who remembers Thermo 101 there is no mechanism for feedback of the 1.2 C. temperature rise to drive evaporation of 1 additional gram of water. CO2 greenhouse adds NO additional energy to the earth system. Feedback is precluded by the second law. There is no amplification physics in the atmosphere and no power source to drive it if there were. That kind of atmospheric water vapor positive feedback is precluded by the three laws. Imagining an infinite positive feedback loop is impossible without a source of energy to drive it. A shorter summary for scientists who need no tutoring on these assertions. Need we repeat in all this “on the average”; nothing more useful can be said of the random chaotic processes which the earth uses to generate this average. Mention of power, watts refers to per sq. meter earth area. The global warming crowd was right about one thing:: “The Science is settled. It was settled in the late 19th century by James Clark Maxwell with his laws of Thermodynamics; Energy cannot be created (nor destroyed, energy must flow only in the direction of negative temperature gradient and a closed system (Earth) must balance any incoming energy with exiting energy, any difference will be retained (at least until it drives a temperature increase to re-balance the energy flow). For CO2 gas doubling there is no energy added to the system nor control of energy entering the system. The incoming energy is determined by solar radiance or activity influencing earth clouds. Considering the case of CO2 change alone, with a constant solar input, CO2 doubling alone in atmospheric density will cause its IR 15 u band to undergo one additional mean free radiation path at the top of the atmosphere before being radiated to space. Assuming this additional path length takes place along a maximum temperature lapse rate of -6.5 C/km of altitude, The CO2 radiation will be from a higher altitude, cooler temperature. This difference in radiation has been computed by Clyde Bast to decrease, using the exacting HITRAN CO2 IR spectra radiation code, to decrease by -4.7watts/m2 . This is the maximum greenhouse effect which the earth can suffer by the CO2 doubling. This deficit increasing to 4.7 watts/m2 over the century as co2 doubles will accumulate energy in the earth system, raising its temperature over nominally 1 century until the increase in temperature of the system, a maximum of ~1.2 K to increases its radiation to balance this 4.7 watt/m2 radiation deficit in the CO2 15u band; . additional water vaporization. There is no increase in received power to fuel any additional water vaporization increase such as would be case of increased solar energy into the earth system where water being by far the major conveyor and radiator (~50 %) of energy to space is a major coolant and must be, perforce, a net negative feedback factor. (The IR window radiates about ~38 % and the CO2 radiates notionally, 10%( ~20 dropping to ~15.3 watts). The important point is; most of the average 240 watts which must be radiated, nominally~121 watts is radiated by the only other important available molecule, H2O ) Calling water vapor a greenhouse gas by its definition of being an IR absorber is misleading since it is also an equal IR radiator and eventually at the appropriate thin atmospheric altitudes, transfers all of any absorbed radiation as well as the major latent heat from condensing water vapor energy to space. These quantities are not meant to be exact, coming from my eyechrometer of satellite measured earth spectrum but serve to focus our attention the the important relative factors to be considered. Parenthetically; a positive feedback control loop as computed by the electronic feedback amplifier equation asserted by the alarmists, represents a power amplifier supplied by an independent source of power which can add energy each time around a positive feedback loop thus increasing the input power to a higher output power (energy is not created, merely added by amplifier designed to add energy from some independent power source). No such physics exists in the atmosphere. (Postulating to glean amplification power from the earth surface would merely reduce the input ‘signal’ by the same amount which one would add to the output thus no net gain in output power could exist). Conjectured loops without any increase in average available energy to power them are a thermodynamic impossibility. It is same old “created energy” to power perpetual motion so often promulgated by alarmists. Attribution of any specific part of ‘global average temperature’ measurements to CO2 is absurd. The other mentioned both long and short term drivers of earth temperature outrank CO2 Greenhouse effects by a large margin and are random and chaotic in themselves. We must look to fundamental physics to understand CO2 GH which has been agreed to by all for decades is only ~ 1 C per 2xCO2 .. all the rest of the ‘projections’ depend on a non-existent positive feedback of water vapor in the atmosphere. From fundamental thermodynamic physics and feedback control theory this cannot and does not happen. Thus all the various, arbitrary model ‘projections’ of 2…4 1/2 multiplier of this 1 C are bogus. The reason that they have never been able to narrow down these projections is that they do not apply fundamental thermodynamics to the question. If they did they would realize that atmospheric water vapor feedback energy from CO2 GH temperature increase alone equals zero. (CO2 adds no energy to the system and cannot modulate the solar power/cloud source into the system.) Their fourth failed ‘settled science’ conjecture, (the first three failed both the test of physics and satellite measurements and have been quietly discarded) use the Electronic Engineers equation for positive feedback amplifiers to compute atmospheric temperature increase is even more egregious, representing no atmospheric thermodynamic process, and easily dismissed. Note: With no additional water vapor and a constant 6.5 C. atmospheric lapse rate, the number, quantity and form of the clouds will not be modified except that they will be formed along the same temperature gradient which now exists ~150 meters altitude higher than before the greenhouse temperature surface and air temperature increase. The conjecture of increased absolute humidity increasing with the 1C. temperature increase is a non-starter. It is irrelevant at the lower altitudes since an increment in h2o capture at low altitude is not involved in h2o radiation effect which occurs above the 0C. Average altitude ~2.4 km where all absolute water vapor vs relative humidity curves converge to zero with asymptotic zero slope and are not involved with radiation altitudes. Would that additional water vapor could be recruited to cool the earth since it would be a negative feedback anyway by virtue of additional radiating molecules (area) in Boltzman’s radiation equation. Cries of water vapor being a greenhouse gas should have been long ago been relegated to the dust bin of history and forgotten since they harken back to Hansen era a conjectures of immediate capture of IR at the earth surface strata of atmosphere ‘preventing’ the h2o band radiating directly to space. Note that any small modification to the capture of h2o IR spectrum merely adds a tiny increment to an already vanishingly small radiation capture of a radiation power transmission thru a fractional degree surface to air temperature difference since it occurs in 10’s of meters of altitude where any water vapor is present. Without the fiction of positive feedback to CO2 greenhouse warming, there is no case for CO2 driven warming above the computed maximum 1.2 C/2xCO2. Identification of additional energy to power such a loop must be demanded of the alarmist conjecture. Actual potential positive feedback effects of surface ice reduction or additional CO2 or even methane release to the +1C. greenhouse are dispatched as computed small effects elsewhere are not referenced here since they grow by the day. This is in addition to my previous post to Mr. Chappell. In the 2nd to last paragraph he says that water vapour is not an absorber neither at low altitude nor at any altitude at less than 0 degrees C .But in the 5th paragraph he talks about H20 radiating the 121 watts from any of the absorbed radiation plus the latent heat. So which is it?Does H2O absorb IR and if so at what altitudes? It is a made up formula which fits ties in nicely with Trenberths original energy budget, but that doesnt make it scientific. I am not using the models , I am using the CMIP5 forcing that the models use. There is a difference. The only other assumption is that there is a 100 year relaxation time for the climate to any perturbation .